In my original Scrap Busting post, I shared a mystery scrap project I started working on after I finished my scrappy herringbone quilt top. I use the word "mystery" very literally since it was even a mystery to me. I started out with lots of left over scrappy strips that I turned into scrappy blocks. I then created scrappy HST. I ended up with 76 scrappy HST that I trimmed to 8 inches. At this point, I still didn't know what I was going to do with them. Here's a diagram. Start out with two 12.5" blocks of different colors. Place right sides together with one block turned and sew a 1/4" seam around each outer edge. Use a rotary cutter to cut each diagonal. This gives you 4 HST that measure roughly 8.5". Take the 2 HST that are caddy-corner to each other and sew together to get the mirrored effect. Does that make more sense? I hope so. Here's what my scrappy flying geese look like. I have to admit that I love the clean cut mirrored look the diagram gives for the example, but this scrappy mess is also lots of fun. It takes a bit more effort to find the pattern when the strips are all different sizes and not necessarily all the same exact fabric. I should have the quilt top pieced by this evening. I can now officially say my scraps have been BUSTED! This looks so effective, even though you say it's simple it looks a lot more complicated. Beautiful. Always good to make something simple that looks complicated! I might have to make ten of them to kill my scrap bin. Such an amazing quilt. Lots going on with all the scraps, but controlled in the layout. I love it! Love this! Do you have a tutorial? I like the different widths of strips. Wow, scraps turned into this beautiful top?!? I love it. Great eye to come up with this layout. love the flying geese - this looks really good - might try this with solids! Love your work. I am just starting to write patterns and was wondering how you created the diagram you used in the above post. Thanks for sharing. It looks like you found a great way to add a bit of order into the scrappy chaos. And another really nice sized lap quilt as a result - how awesome! very much reminds me of "orange crush" and shows how a turn of color and HST can change a layout! Truly beautiful. I love the way you set up your HST's. Holy smokes! Lovin' this one! Wow, Janet! I love what you came up with. This is an awesome scrap pattern. I always seem to have lots of strips left and this would be a great use for them! love the results. thanks for the tutorial - I will have to try it soon. These scrappy blocks look like a lot of fun! 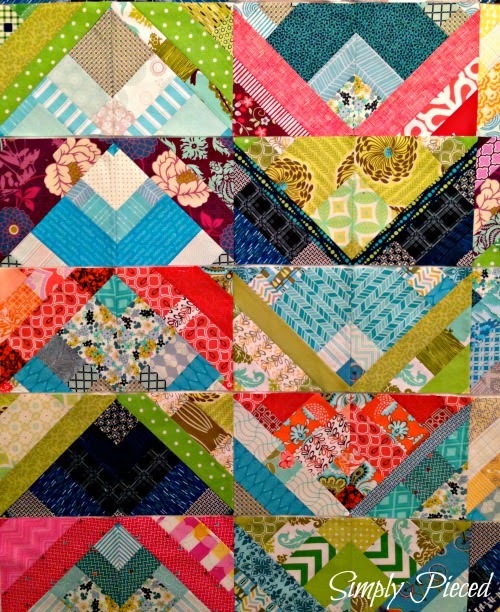 I love colorful scrap q - thanks for quilts - thanks for sharing your process. So fun! I love the colors. This is a great idea. Oh, those scrappy geese are yummy! Thanks for explaining the process - a great scrapbuster, indeed! 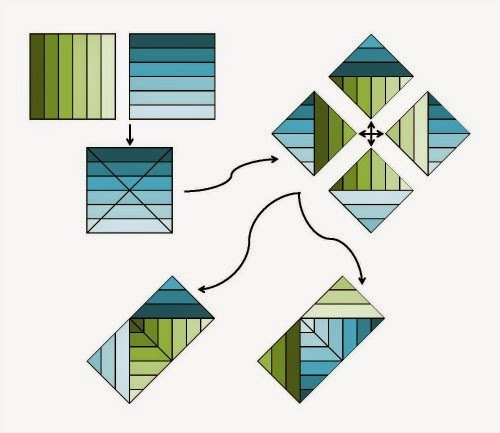 You piecing strategy reminds me of Mary Ellen Hopkins old pattern, Hidden Wells but the layout is different. I like it!! LOVE it!! What a fun use of all of those scraps! Very effective! Yes you lost me in the instructions, but I think if I was actually doing it as I was reading them I could follow properly. Wow, the end result is incredible! What a great way to use scraps. I am in love. 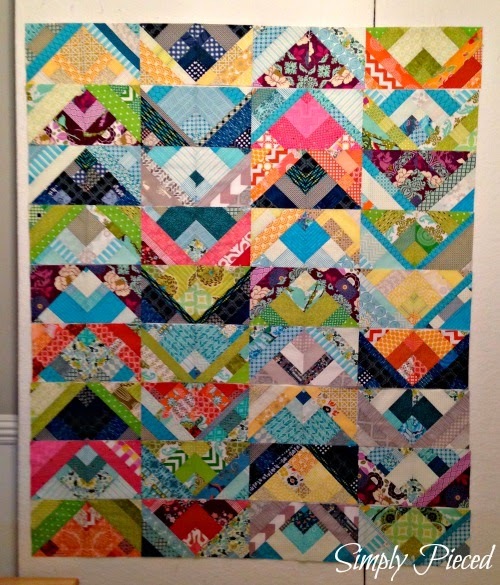 Nothing is more appealing to me than a scrap quilt, and even with bigger pieces to show off my lovely fabrics. Wow. Thank you so much!!! !